December, 1902. Sun. 7. 1º - Fair N.W. gtle. Only 7º above at noon. 4º - evg. - at church morn. & evg. Mon. 8. 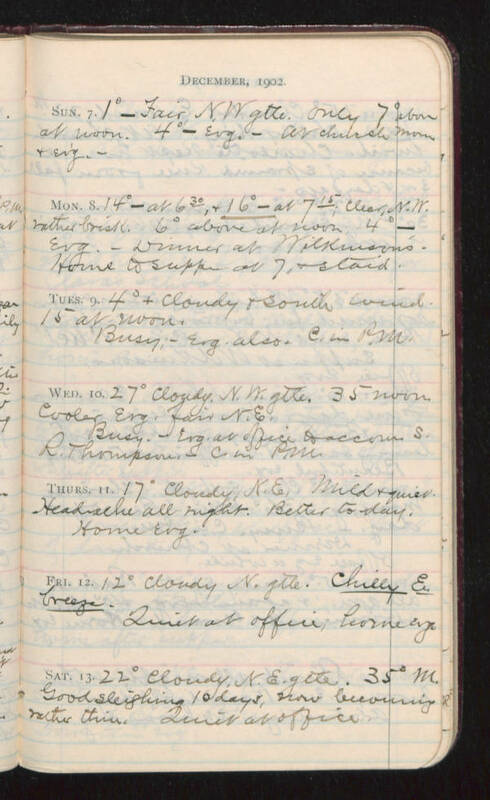 14º - at 630, & 16º - at 715; clear, N.W. rather brisk. 6º above at noon. 4º - evg. - Dinner at Wilkinson's. Home to supper at 7 & staid. Tues. 9. 4º & cloudy & south wind. 15 at noon. Busy; evg. also. C. in P.M. Wed. 10. 27º Cloudy. N.W. gtle. 35 noon. Cooler evg. fair N.E. Busy. - evg at office to accom. S. R. Thompson. 5 C. in P.M. Thurs. 11. 17º Cloudy. N.E. Mild & quiet. Headache all night. Better to-day. Home, evg. Fri. 12. 12º Cloudy N. gtle. Chilly E. breeze. Quiet at office; home evg. Sat. 13. 22º Cloudy. N.E. gtle. 35º M. Good sleighing 10 days, now becoming rather thin. Quiet at office.